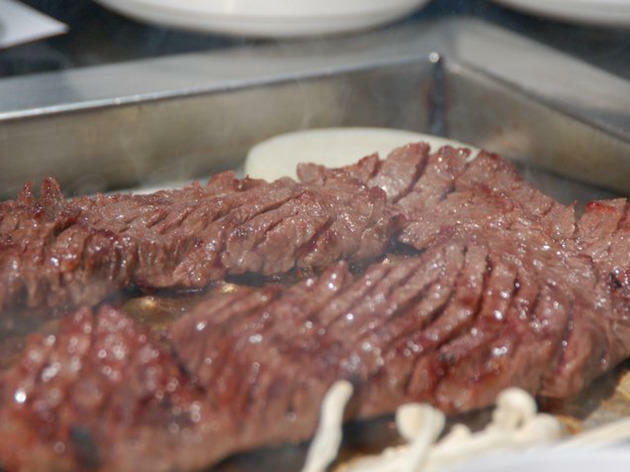 This isn't your average Korean BBQ joint. 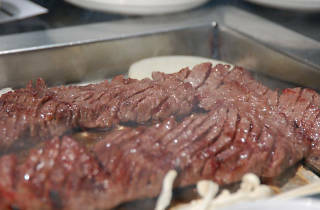 Park's takes meat more seriously than most, serving prime and kobe-style beef in a setting that feels a bit more modern than nearly anywhere else in K-town. Grab a large crew to try a bit of everything: There's boneless wagyu short rib, seasoned pork belly, succulent house galbi, beef tripe and nearly anything else you can imagine throwing onto the grill (though technically, they'll be throwing it on the grill for you). It's a little pricier than most KBBQ spots in town, but worth the splurge. It's on the pricey side, but the meat quality is the best. Their banchan, especially the kimchi, is excellent as well. The atmosphere is comfortable but not fancy. But then again, are you a real foodie or not? Their meat is so good! Their service is also good, but I love their meat over everything else. and the bbq is the best place I've ever tried. This is my favorite Korean BBQ restaurant. It's honestly the best I've ever had, which shouldn't be a surprise after you walk in and see the autographs of all the restaurant's famous patrons. But aside from the good food, the customer service has been awesome. One time there was a long wait but they ushered us upstairs where we sat at a table and ate sides of kimchi and egg noodles and drank until our official table was ready. Another time we ordered something random on the menu that we weren't exactly sure of and our waitress came back to us and recommended we switch our order. We appreciated she was looking out for us!